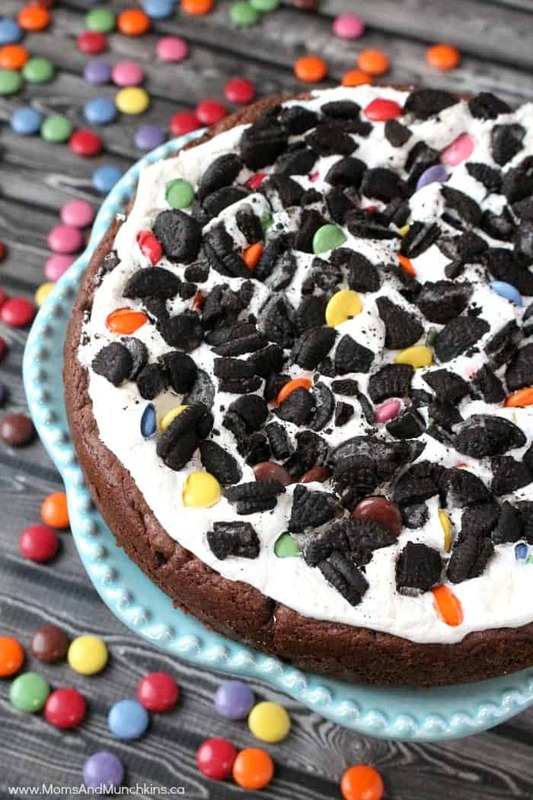 This Marshmallow Cookie Cake really couldn’t be any easier to make and it’s a hit with both kids and adults. The recipe is so easy that your kids can help you make it. 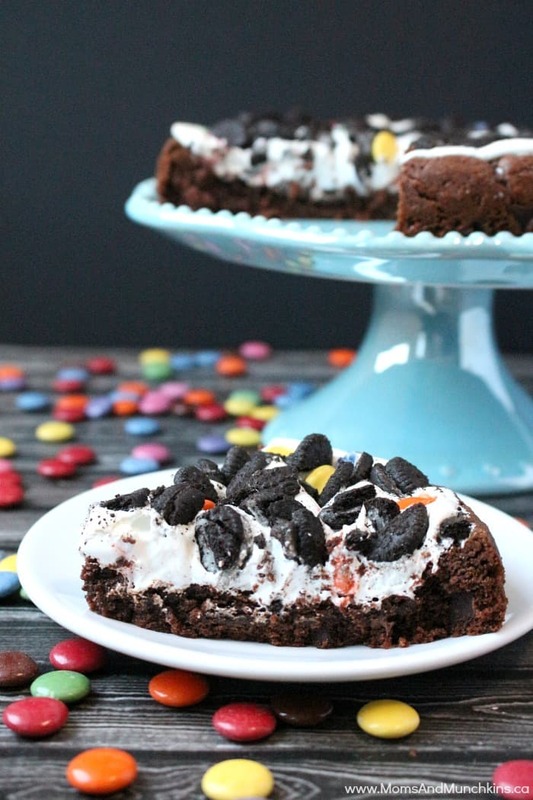 This treat makes a great birthday party dessert! I prefer to serve it as a cake with forks but you can go ahead and pick it up to eat it like a pizza slice – just be sure to have extra napkins available. Be sure to let this cake cool completely before removing from the pan so that everything stays in one piece. You can bake this as squares instead of in a round cake pan. If you’re baking it in a 13″ x 9″ cake pan, reduce the cookie base baking time to 10 minutes. 1 pouch Betty Crocker Double Chocolate Chunk Cookie Mix plus the vegetable oil (1/4 cup), water (2 tablespoons) and egg (1) called for on the package. Spread dough in ungreased 9" round pan. Spread marshmallow creme evenly over crust. Sprinkle with chopped cookies and chocolate candies. Bake for another 12 to 14 minutes until marshmallows begin to brown. Cool completely (about 1 hour) before cutting. For more delicious desserts, visit our Recipes page. We have lots of great recipes for holiday baking, bake sales, birthday parties, tea parties and more. So many yummy desserts to choose from! We’re always adding new ideas for recipes, parties and family fun. Never miss an update by following us on Facebook, Twitter, Pinterest and Instagram.